Affordable Violin Lessons. Toronto's Best Violin Instructors. Affordable Violin Lessons. Toronto’s Best Violin Instructors. Elite Music Academy offers the most comprehensive violin lessons in Toronto! In our music school, you’re treated like family by professionals who care about your goals and aspirations. We offer a trial lesson to meet with any of our violin teachers and complimentary violin rentals for the first two months of lessons. We’ve selected our staff from the best violinists in Toronto, based on mastery of their instrument and experience teaching. Depending on your preference, our instructors can provide either contemporary fiddle or classical violin lessons. We even get bluegrass fiddlers from time to time! Teachers work with students on a range of subjects such as music theory, sight-reading, and improvisation. For our advanced students, we help them develop technique, mastery, and explore different styles and time periods. Our school also provides students opportunities to develop their musicianship outside their private violin lessons. Students can record their music with a professional sound engineer in our studio and perform at cool venues around Toronto, including clubs, theaters, restaurants, and coffee shops. When you search for violin lessons in Toronto, you’ll find plenty of options. However, if you want to develop musicianship, network with other students, record and perform, then Elite Music Academy is the place for you! Violin Lessons in Toronto: No Strings Attached! Our music school provides cosy classrooms and outstanding violinists. Take a trial lesson. No obligation to register. Meet the teacher, ask questions, and set goals. Not sure if violin or viola is right for you? Save your money and rent one. Record your violin. Play on stage and feel appreciated. Record your violin with our sound engineer and perform around Toronto. 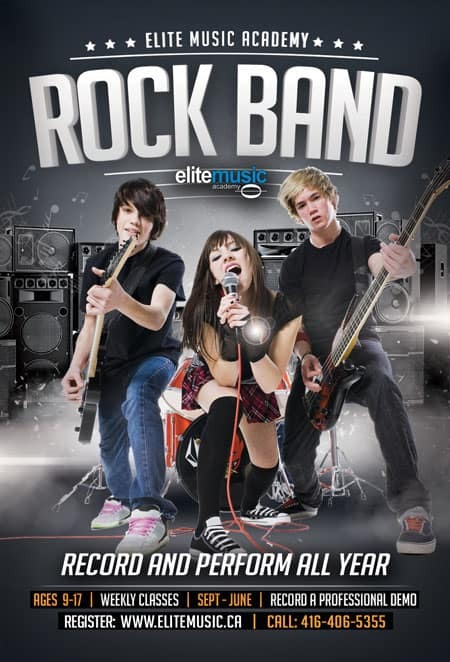 Check out our summer Toronto Music Camp and yearly Rock Band programs. We’ve got great lesson rates and policies and we’re open 7 days a week. Our nicely renovated music studios will make you feel at home. Tell us about your musical goals for violin! 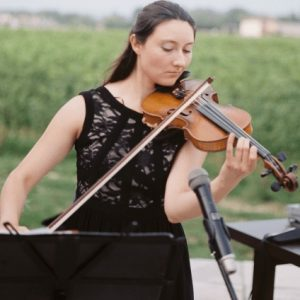 Arie is a classical violist and violinist with modern sensibilities. Arie brings an appreciation for all forms of music making on the violin and hopes to turn it into a social instrument. He also plays Cletic and Klezmer music! Develop musicality and appreciation for the violin regardless of age and level. 1. Violin is one of the most expressive (and romantic) melodic instruments ever. 2. Learning how to read complex violin sheet music improves concentration. 3. The violin is a portable instrument you can play anywhere, unplugged. 4. Regular violin practice instils discipline and confidence. 5. Free therapy: use the violin to release your inner angst and relieve depression. 6. Learning violin improves coordination and fine motor skills. 7. The violin has a rich history and hundreds of years worth of repertoire. 8. Buying or renting a quality violin in Toronto is affordable. 9. Einstein credits his passion for violin as inspiration for his discoveries. 10. Learning to play violin can help a child’s academic achievement. What’s the difference between a fiddle and a violin? It’s the same instrument; however, there are a few minor differences between a fiddle and violin. What age should my child start violin lessons? Although some three and four year old kids can handle learning violin, there’s other factors to consider. What do I need to know about practicing violin? Our violin teachers have put together violin practice tips and an article on how to practice mindfully. How do I pick the best violin instructor? Ask for a trial violin lesson before making a commitment. Here are 6 things you should consider when shopping for a fiddle teacher. What size violin does my child need? Get a measuring tape and follow this guide on how to pick the right size violin. What should I do if my child wants to quit violin? There are several things you can do to keep your child from quitting violin lessons. Does your music school provide performance opportunities? Yes! We’re a performance based music school! You can also fiddle away at any of these open mic venues along The Danforth. Is it true that it’s never too late to learn violin? Adults face different challenges than kids when taking violin lessons for the first time. Here some great tips to succeed.